Are your old SentriLock boxes collecting dust or become doorstops? Introducing the SMDRA SentriLock Upgrade Exchange Program. Purchase the new SentriLock Bluetooth lockboxes and receive 15% OFF when you exchange an old SentriLock box. Subscription fee waived until August 2018 – a $95 value! FREE SMDRA safety branded SentriCard (used as a back up to SentriSmart App). For complete program details and FAQs CLICK HERE to download the 2-page SMDRA SentriLock Upgrade Exchange Program PDF document. Sentrilock® electronic lockboxes are a REALTOR® only product and provide maximum security for clients. They track when someone uses the box to enter a home, can be set to only allow REALTORS® and clients to visit during certain hours, and come with round the clock tech support. Why Should I use a Sentrilock? In a survey of homeowners nationwide, it was found that a great majority preferred an electronic lockbox. Electronic lockboxes provide better security, online reports and showing data, quick feedback on showings, and greater control over who enters the home. 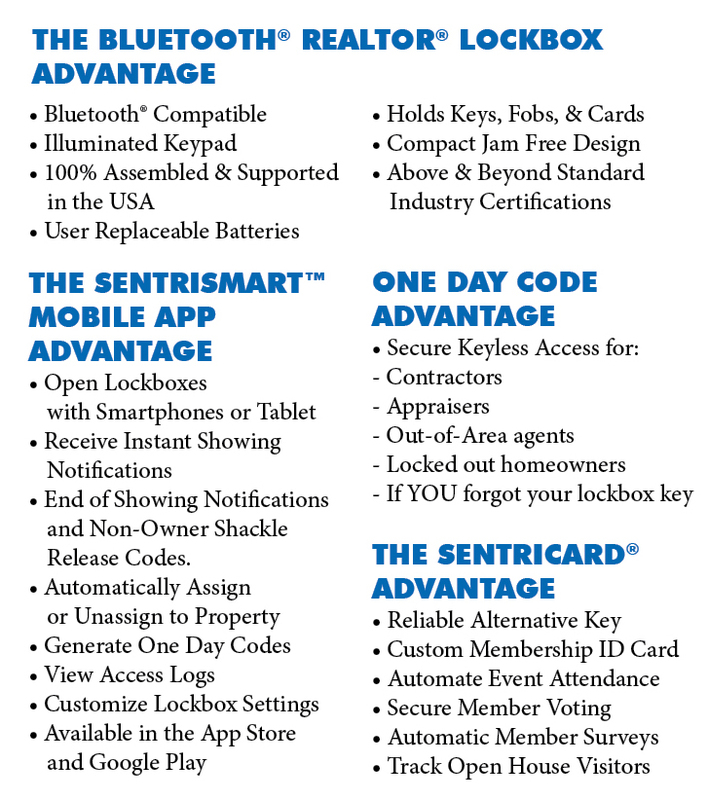 Sentrilock lockboxes require a user-specific access method only available to REALTORS® via their local REALTOR® association/MLS, or a unique and daily changing code. This way, the identity of every person accessing the box is recorded for every visit. Show your clients you are looking out for their best interests and win more listings – better for your clients, better for your business! How Do I Get a Sentrilock? To set up a Sentrilock account, please visit your primary local REALTOR® association. Sentrilock accounts take approximately 20 minutes to set up, and do not require an appointment. SMDRA is proud to offer all primary SMDRA members use of the Sentrilock Library. 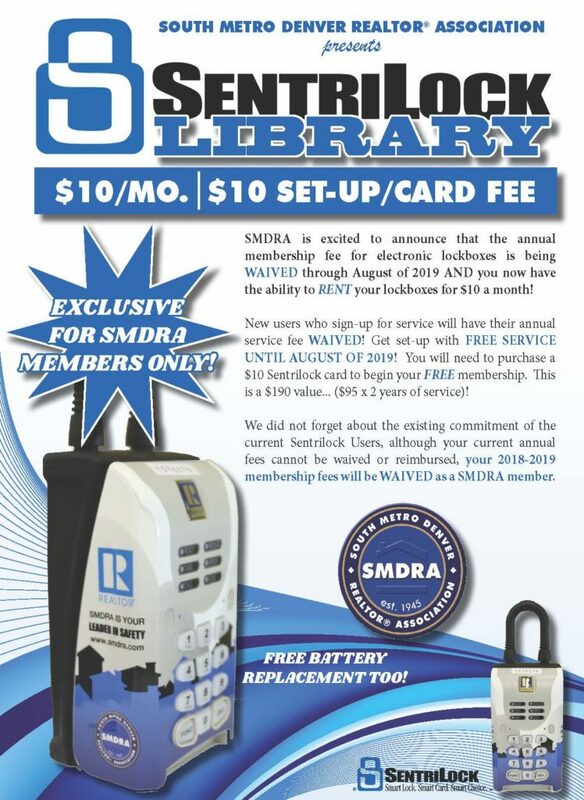 After an initial set up fee of $10, SMDRA REALTORS® can rent a lockbox for only $10 a month*. Sentrilock user fees are waived through August of 2019 for new users. 2018-2019 fees will be waived for existing users. No, you do not need to set up an appointment, although SMDRA does recommend calling ahead of time to ensure a member of SMDRA staff will be able to fully assist you. If you have recently transferred association membership, please check the local MLS to make sure your account information with them is correct before setting up a Sentrilock account. Sentrilock routes through the MLS, and SMDRA cannot setup your account if your association membership information is incorrect. Can I purchase one lockbox for my whole team to use? Yes, Sentrilock lockboxes can be shared by REALTOR® teams and with assistants. What if I bought a box from another agent? If you have purchased a Sentrilock lockbox from another agent, you will need to come to the SMDRA office to have the box transferred to you. Please come prepared with printed proof that the lockbox was sold to you. The SMDRA office provides Sentrilock batteries for sale, and staff is happy to change out your lockbox batteries for no additional charge. 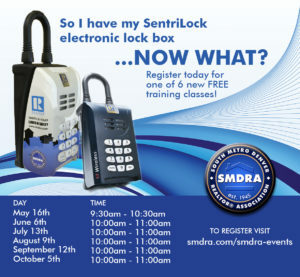 SMDRA also provides Sentrilock PowerPaddles to revive dead boxes, which can be checked out and returned.